Let's take a look at the major marketing trends for 2010 that will affect both business-to-business (B2B) and consumer (B2C) companies so we can update our marketing strategies for 2010. When something becomes a "hot trend" it does so for two reasons. First, it's a product or activity that has been proven and refined. And, second, it's growing in adoption. The hot marketing trends for 2010 are all visible as we enter the year, and these trends are growing to the point where we need to adjust our marketing communications and sales strategies to take advantage of them. Some of the hot marketing trends are rather obvious, such as the growing use of social media. But it's important to identify the "big marketing trends" for 2010 that can help define effective marketing strategies for 2010. Big Marketing Trend #1: Personal — Communicate with individuals to carry on conversations about meeting their needs and solving their problems. Big Marketing Trend #2: Local — Participate in personal, face-to-face meetings, events, and activities near where your product will be used because fewer customers will be flying to national events and conferences. Big Marketing Trend #3: Mobile — Reach customers anywhere at any time with the 24/7 connectivity of mobile devices. 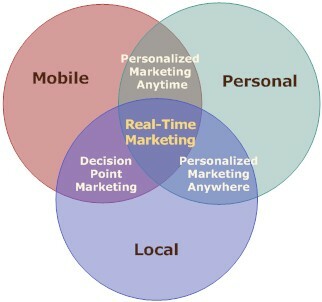 These three big marketing trends for 2010 overlap and reinforce each other to provide marketing opportunities to connect with your customers and increase revenue. Marketing Trend Opportunity #2: Personal + Local — Tailor marketing messages based on each person's purchase process, starting with their information gathering and continuing through their searching, purchasing, and reordering. Marketing Trend Opportunity #3: Mobile + Local — Deliver product and solution information to customers at the location where the purchase decisions are being made using mobile devices and local Internet searches. Marketing Trend Opportunity #4: Personal + Local + Mobile — Use one-to-one marketing to treat different customers differently — anywhere, anytime, and using any medium they want, whether it's text, telephone, Web, mobile app, or video. Continue reading Marketing Trends for 2010 - And What to Do About Them. Marketing has become more and more complex as the Internet has become part of everyone's lives. Blogs have sprung up everywhere on all aspects of marketing, but it's been hard to find the really good marketing blogs, especially good blogs on B-to-B marketing. Recently, a couple of really savvy guys created a great site that allows us marketers to find the latest blog posts on B-to-B marketing from some top notch marketers. I added B2B Marketing Zone to my blog reader when it launched, and it's made it so much easier to keep up on hot B2B marketing topics. I'm pleased that my blog has been added to B2B Marketing Zone, so my posts on marketing strategy are now available there, too. I suggest that you add B2B Marketing Zone to your blog reader, bookmarks, or a Post-it on your computer so you can get in the "Zone" every day. Raising awareness of your product in your target market is where sales begin, and this is where marketing communications activities begin the selling process. With today's multiple channels for content to reach potential customers, the art and science of marketing communications has become increasingly important. The marketing communications function (commonly called "marcom") has many communications tools available. Some companies in an industry might rely on paid advertising in print and online media. While other companies in the same industry might rely on a very different media mix, such as public relations and events. However, no company can be sure they are using the most efficient media mix without creating a marcom strategy that is aligned with their overall strategic marketing direction. The marketing communications strategy process usually begins with creating a "messaging strategy" -- determining the consistent theme or fundamental selling message that will he used in all marketing materials. Another key part of the messaging process is creating the positioning statement. This two sentence statement tells what you sell, to whom, and why customers should buy it. As you move through the process of creating a positioning statement, you'll want to capture your brainstorming results, such as in your marketing strategy mind map. Then, refine and test those creative approaches until you settle on your company's positioning statement. Your positioning statement is critical to making all of the other parts of the marketing communications strategy work well. This is because every awareness-building and product information program needs to paint a clear, concise picture of what you sell and how customers will benefit from using your products. A mind map is a good way to capture ideas about which programs look like they will be most effective. 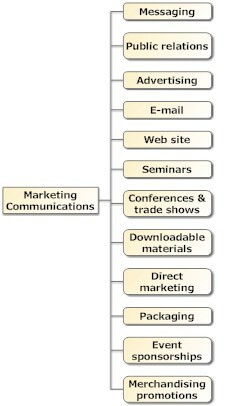 Add these programs to the Marketing Communications section of your strategic marketing mind map. Later, evaluate each program to see if it should be in your final strategic marketing plan. In large companies where each marketing program has its own manager, you can link your main strategic marketing mind map to each program's own planning mind map. In companies where the whole marcom strategy is implemented by one team, you can add details about marcom programs in the team's main marketing mind map. The process of creating a marcom strategy has gotten more complex as more marketing activities move to the Internet. This has made it even more important to understand customer segments and how to communicate with those potential customers. When you develop a marcom strategy based on a sound strategic marketing view of your market your marcom program will be more effective -- and customers will have a better, more consistent brand experience.